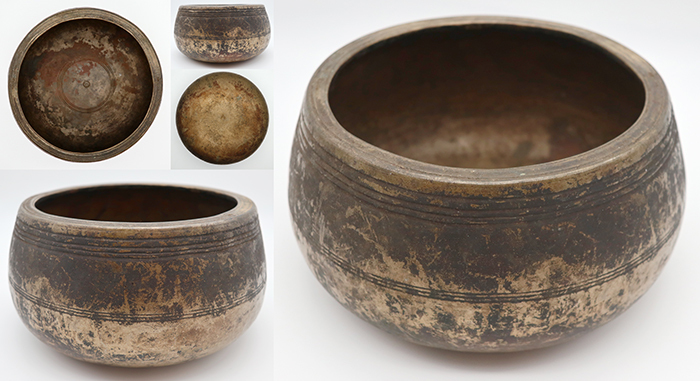 This large Antique Mani Singing Bowl is in its grubby ‘as found’ condition. However, it is a superb example of this rare bowl form and all its features remain well defined. It is possible to clean a bowl like this with effort, if desired, but I prefer antique bowls to reflect their life story if the sound is good. This bowl has a fifth octave Eb (618Hz - 620Hz) fundamental when struck or played around the rim with a wooden ringer. It has a strong voice with a good beat, and unlike some, it’s responsive and easy to play around the rim. It has all the typical characteristics of this ancient bowl form…flat bottom, bulbous tapering walls, wide inward-facing grooved lip, and decorative bands forming a collar around the outer rim and belly. There are concentric circles at its centre, including an eye. It is in excellent structural condition, with some patches of copper oxidization inside. A nice example of this ancient bowl form! Antique Mani bowls are generally thought to be between 200 and 400 years old and are now extremely rare, especially large ones such as this. A Tibetan silk brocade bowl cushion and a ringer are included in the price.